Reseda Artwalk – register to participate! For those who grew up in the Valley prior to the 1990s, Reseda was a bustling commercial and social center. It went through hard times and was a CRA project area that was boarded up and left blighted. The NoHo Arts District dot com team remembers going clothes shopping at Aardvarks and The Competition, buying vinyl at Licorice Pizza, going grocery shopping at Von’s before for it became Jon’s, getting our hair cut at Antenna by punk rock gals with pink hair, roller skating at Sherman Square roller rink, and going to the Country Club to hear live music. Our neighobors and the folks at 11:11 ACC are going to make Reseda come alive again, at least for one night. SAVE THE DATE! June 4, 2016. Reseda, on Sherman Way between Reseda & Lindley, will come alive with live art, light & interactive installations, projection mapping, independent artists and vendors, live music and more! Sponsored by Council District 3's initiative Reseda Rising, supported by The Department of Cultural Affairs and produced by 11:11 ACC, the Reseda Artwalk and Night Market is a one night event promoting beautification, revitalization and activation of the Great Streets Sherman Way corridor in Reseda. 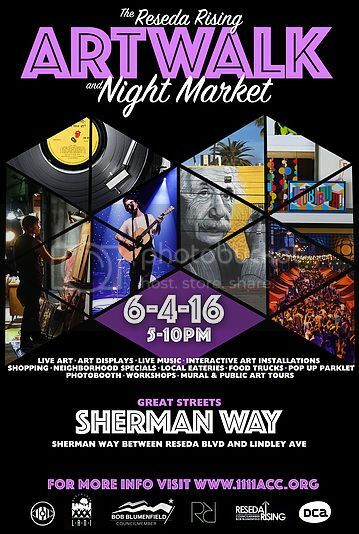 The Reseda Artwalk and Night Market is a family friendly event and a perfect excuse to bring out the kids and pups to enjoy the neighborhood! Participate in the Reseda Artwalk! Please contact 11:11 ACC if you're a band or musician who would like to be featured on their live music stage, if you're an artist or vendor who would like a booth space (Register HERE) or if you have any ideas you'd like to incorporate into the festivities! They encourage participation, busking, flash mobs, bike rides, derby girls, parades and taking initiative! **** For information on Los Angeles theatre, tickets to theatre in North Hollywood's NoHo Arts District, theatre reviews, the NoHo Event Calendar, restaurants, news and local businesses in NoHo, or anything and everything about the NoHo Arts Community, bookmark nohoartsdistrict.com. Follow us on Twitter @OfficialNoHo.